Unstructured files can be stored in the VARBINARY or IMAGE column of a SQL Server table. This approach is effective to maintain transactional consistency and reduces the file management complexity, but when the client application reads data from the SQL table, it uses SQL memory which leads to poor performance. Instead of storing the entire file in the SQL table, store the physical location of the unstructured file in SQL Table. This approach gives huge performance improvement, but it does not ensure the transactional consistency moreover file management was difficult too. The FILESTREAM feature is very effective because it allows storing BLOB files in the NT file system and maintains the transactional consistency. When a client application reads data from the FILESTREAM container, instead of using the memory of the SQL Server buffer, it uses Nthe T system cache which improves the performance. FILESTREAM is not a datatype. It’s an attribute which can be assigned to the VARBINARY(MAX) column. When the VARBINARY(MAX) column is assigned to the FILESTREAM attribute, it is called a FILESTREAM column. Data stored in the FILESTREAM column will be stored in the NT system as a disk file, and pointer of the file is stored in the table. The VARBINARY(max) column with the FILESTREAM attribute assigned does not have a limit of storing 2 GB in the table. Hence, we can store huge files as well. How to enable FILESTREAM feature. How to create and configure FILESTREAM filegroups and FILESTREAM data container. How to store and access data from the FILESTREAM enabled tables. To configure FileStream in SQL Server, make the following changes to SQL Server. Enable the FILESTREAM feature from SQL Server Configuration Manager. 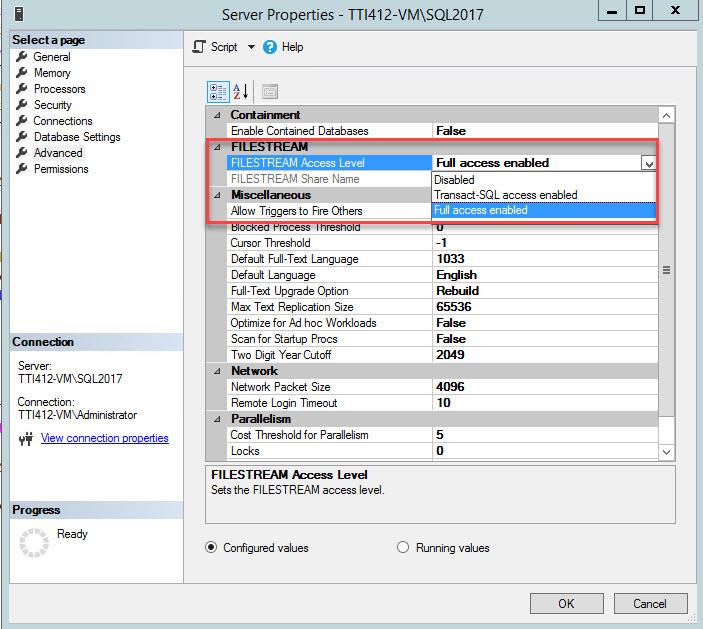 Enable teh FILESTREAM access level on SQL Server instance. Create a FILESTREAM filegroup and a FileStream container to store BLOB data. Click OK and restart the SQL service. 0 means the FILESTREAM support for SQL instance is disabled. 1 means the FILESTREAM support for T-SQL is enabled. 2 means the FILESTREAM support for T-SQL and Win32 streaming access is enabled. 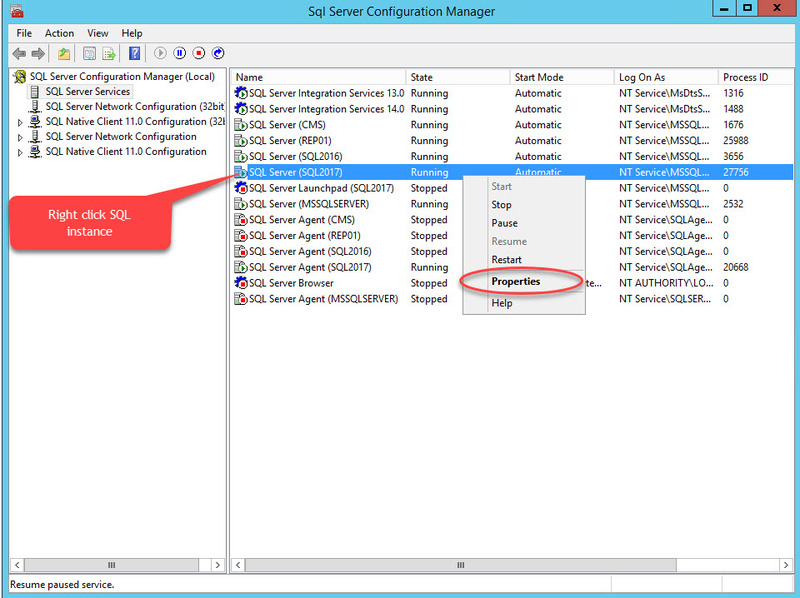 Once the parameter is changed, restart SQL Server services. Once FILESTREAM is enabled, add the FILESTREAM filegroup and FILESTREAM container. To verify that the FileStream container has been created, open Windows Explorer and navigate to the “E:\Dummy-Document” directory. As shown in the above image, the $FSLOG directory and the filestream.hdr file have been created. $FSLOG is like SQL server T-Log, and filestream.hdr contains metadata of FILESTREAM. Make sure that you do not change or edit those files. The “RootDirectory” column to store file location. The “Filename” column to store the name of the file. The “FileAttribute” column to store File attribute (Raw/Directory. The “FileCreateDate” column to store file creation time. The “FileSize” column to store the Size of the file. The “FileStreamCol” column to store the content of the file in the binary format. Once FILESTREAM configures, create an SQL table with the FILESTREAM columns to store various files in the SQL server table. As I mentioned above, FILESTREAM is not a datatype. It’s an attribute that we add to the varbinary(max) column in the FILESTREAM-enabled table. When you create a FILESTREAM-enabled table, make sure that you add a UNIQUEIDENTIFIER column that has the ROWGUIDCOL and UNIQUE attributes. 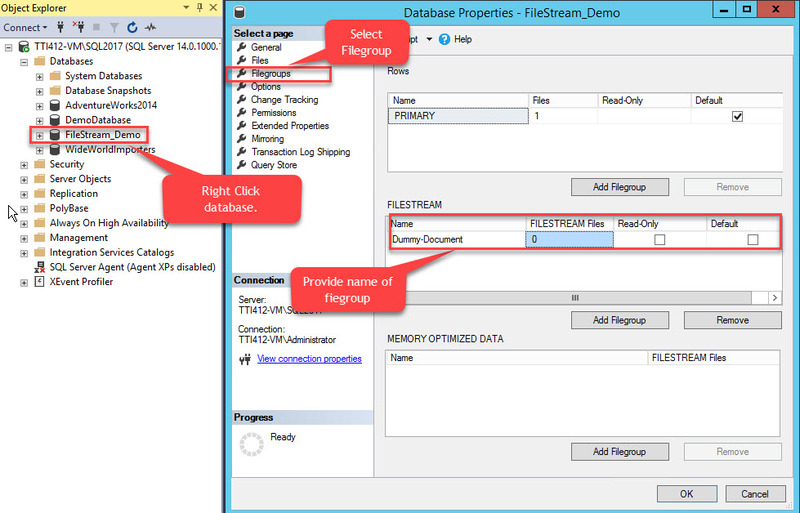 The FILESTREAM data can be accessed by using T-SQL and Managed API. 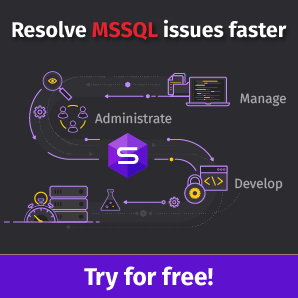 When the FILESTREAM column accessed using T-SQL query, it uses SQL memory to read the content of the data file and send the data to the client application. When the FILESTREAM column is accessed using Win32 Managed API, it does not use SQL Server memory. It uses the streaming capability of the NT file system which gives performance benefits. As shown in the above image, the “WorldWide_Importors.xls” document has been converted into a BLOB that is stored in the “FileStreamCol” column. Although accessing FILESTREAM using Win32 API gives a performance and other benefits, but it has different and difficult syntaxes than T-SQL syntaxes which makes it difficult to access data. Firstly, to locate the file on FILESTREAM data store, we must identify the logical path to identify the file in the FILESTREAM data store uniquely. We can do it by using the Pathname() method of FILESTREAM column. It is case sensitive. After retrieving the path of File, to access, we must obtain transaction context by using the Begin Transaction method. Once transaction context has been obtained, we can access it using the SQLFileStream class. The code below obtains the local path to the WorldWide_Importors.xls document in the FILESTREAM data store. Deleting files is straightforward. You need to run the delete query to remove the file from the FILESTREAM enabled SQL table. Even though the record has been deleted from tables, the file will be available in the FILSTREAM data store physically. It will be deleted by Garbage Collector. Garbage Collector process executes when the checkpoint event occurs. By giving an explicit checkpoint, you can delete it immediately after deleting from the table. Introduction of FILESTREAM and what are the benefits. How to enable FILESTREAM feature on SQL server instance. Create and Configure the FILESTREAM data store and Filegroups. 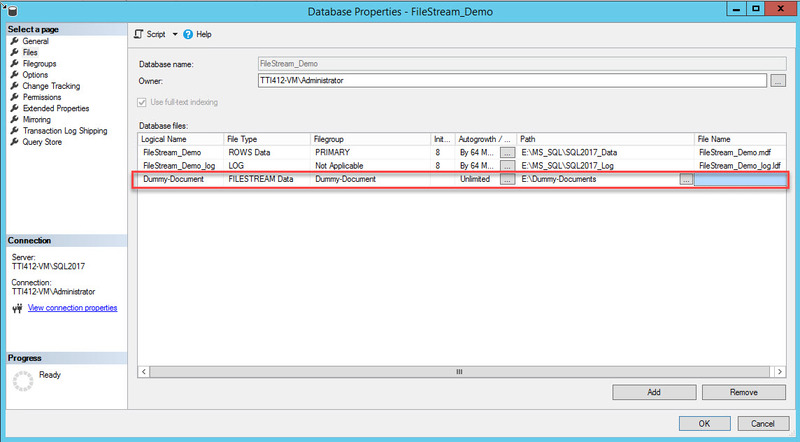 Perform Insert and Delete Files from FILESTREAM data store. How to backup and restore FILESTREAM enabled database. Setting up replication and table portioning in FILESTREAM tables. Nisarg is a SQL Server Database Administrator and Microsoft certified professional who has more than 5 years of experience with SQL Server administration and 2 years with Oracle 10g database administration. He has expertise in database design, performance tuning, backup and recovery, HA and DR setup, database migrations and upgrades. He has completed the Bachelors in Information Technology from Ganpat University.